I’ve been cooking up a lot of warm and cozy comfort food at work lately and popular every winter with clients are root vegetables of all kinds. Today I made this easy, versatile beet side dish. It’s super flavorful and would be good with different menus year-round. Try it with warm, freshly roasted beets or room temp at a BBQ in the summer. 1. First order of business is roasting your beets. Preheat the oven to 400. I roast them this way all the time — to put on salads, to eat plain or with a little lemon juice and salt and pepper and for other recipes. Rinse beets. Cut off tops and tails and wrap individually in foil. If the beets are really large (bigger than a baseball) I usually cut them in half and wrap each half in foil. Place a sheet of foil on the middle oven rack. As the beets roast, they will leak juice (especially if they are cut in half). Do yourself a favor with the foil — nobody wants to spend the night scrubbing burnt beet juice from the bottom of the oven. Arrange beets on foil and roast for 1 hour. Leave wrapped when they come out of the oven. I usually leave them until I’m ready to wrap up everything else that I’m cooking (so they might sit there on the counter for another hour sometimes). More on that later. 2. Place walnuts in a dry skillet and toast over medium heat, stirring frequently, until they become fragrant (about 4 minutes). 3. Whisk the vinegar, lemon juice, shallot, dill and oil together in a small bowl. Add salt and pepper to taste. 4. Time to get back to the beets. By the time you unwrap them when you’re ready to put things together the peel will usually slide right off. If they don’t, grab your trusty vegetable peeler. Slice or dice or rough chop them — what you feel like. I often go for 1-inch cubes. 5. Toss dressing, beets and walnuts together in a medium bowl and dig in! 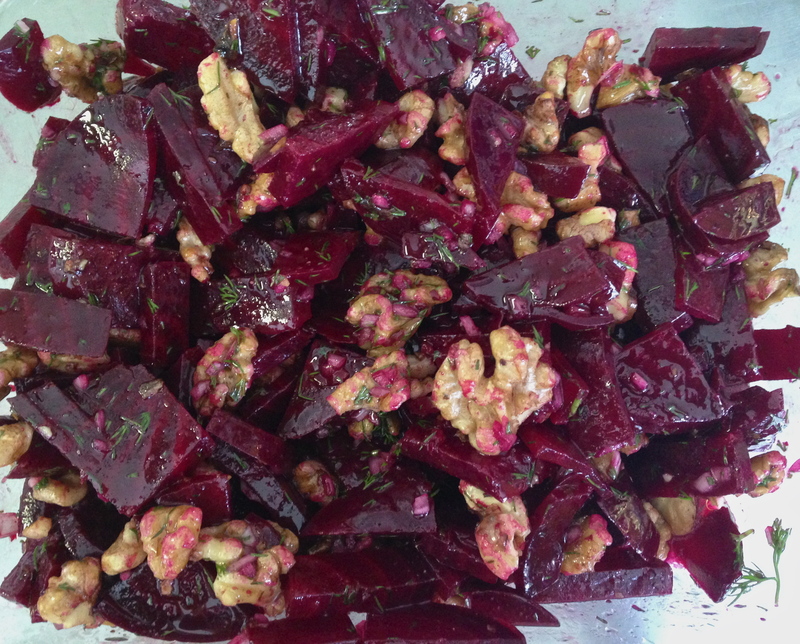 This entry was posted in Side Dishes and tagged beet side dish, beets, beets with walnut dill vinaigrette, roasted beets, root vegetables, winter side dish. Bookmark the permalink.